Bananas foster flavor has a captivating taste. Your taste buds will be all over the place, from the buttery banana flavor to the cinnamon rum taste. You don’t want to miss this experience in your favorite dessert, drinks and baking treats. 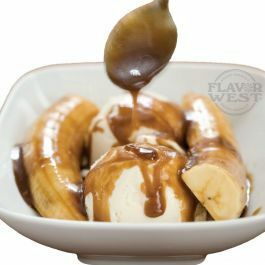 Type: Bananas Foster Soluble Flavoring. Ingredients: Natural and Artificial Flavoring, Propylene Glycol. USP Kosher Grade Flavoring. Usage Rate: 15-20% for E-use. Flavor suitability: Desserts, pastries and baked treats, yogurt, ice cream, candy and more. Specific Gravity: 1.11 No Refunds on Flavoring. its very alcoholic in taste, but its ok.